AMONG THE notable offerings in next week’s Galway Film Fleadh is Staid, the debut feature written and directed by Wexford's Paul O’Brien, which will be screened in the Town Hall Studio on July 9 at 4.30pm. A bittersweet movie about love, music, loneliness and moving on, Staid sees four small-town friends come together to bicker, sing, talk, smoke, drink, laugh, leave and return — and stumble towards the reality that their lives are finally changing. A playwright and novelist, O’Brien adapted Staid from his own play, One Last Long Breath, which he first staged 15 years ago. “About two years ago I took the play back out of the drawer and felt I understood it now,” he tells me, recounting how the film came about. “I wrote it when I was in my early 20s and I didn’t really understand the story then. We put the play on here again in Wexford and it sold out for a 12 night run. "It got such an amazing response that I realised we were only scratching the surface. 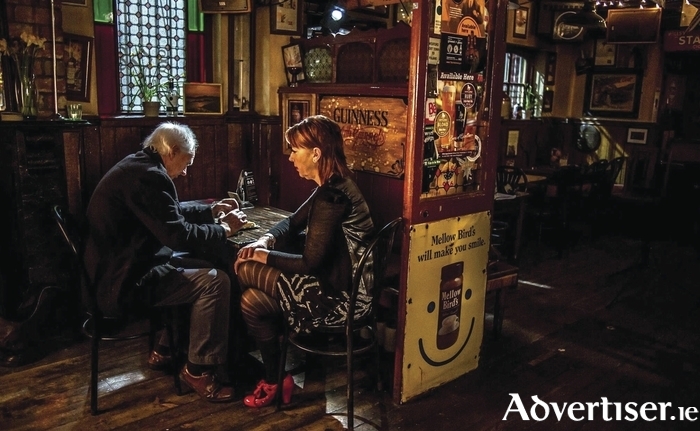 I had a cast – Adrienne Meyler, Stephen Murphy, Paul Creane and Phil Lyons - who had magic between them and I wanted to capture that a bit more. Also, I knew what I could do myself technically and that I could make this look like a movie that could stand up anywhere in the world. Staid premiered at the Dublin Film Festival earlier this year and has now being picked up by festivals as far apart as Sydney and Hong Kong, as well as Galway. Last month it was named as Best Foreign Feature Film at the Los Angeles Independent Film Festival; not bad going for a film that cost a mere €300. “It was all self financed,” O’Brien tells me. “The budget was €300 and €250 was spent on one scene. No one on this had a previous movie credit, we were all figuring it out as we went along. Our lighting rig was €30, we had two lamps, those back garden security lamps –that was our lighting rig! Mostly it was just three or four of us walking around Wexford, setting up the camera, shooting a scene and moving onto the next location. It is a tiny little movie, 90 per cent of it is shot in one location, and now it is getting embraced internationally which brings me a huge amount of joy. “The film is about four people in small town Ireland who are stuck. They can’t seem to move on in life or some of them don’t want to move on, they just want to look back down memory lane. An event happens that brings these four people back together, some of them have had old relationships, some of them are in new ones. Sparks happen in the movie that project them all forward, their lives start to turn again. I ask Paul did he re-write his initial play greatly in transforming it into Staid; “I completely re-wrote it, though I’d say 90 per cent of what was there 15 years ago made it into the film, I just found a better way of writing it,” he replies. “It’s the same characters, the same premises, the same set up and execution but I think I have become better as a writer, and I’ve got older. Aside from Staid things are also happening for O’Brien on other fronts; his trilogy of novels Blood Red Turns Dollar Green, set in the shady world of American wrestling, have been been snapped up by Sky Horse Publishers in New York. He also has two US TV pilots in development, and has been asked to work with WWE Hall of Famer Jim Ross on his autobiography. I think it’s a safe bet that, this time round, Staid will draw way more than eight people, and more than likely get a deserved full house. Book early to avoid disappointment, as the saying goes.